Changed the release date. Moved from August 12th to June 17th. It will now square off against the DC Comics action film "The Green Lantern" and the comedy "Bad Teacher" with Cameron Diaz and Justin Timberlake. I'm not sure if releasing it against such a big movie like Green Lantern is the best possible thing for this movie. I wonder if it's because the studio heads thought it was a good idea, or did they start to lose faith in this film? I just went 2 the site here in Portugal of the theater company who shows the movies and I'm super excited! Portugal - June, 16 2011! I cannot WAIT to see this movie! 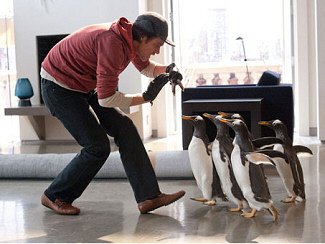 Jim Carrey + penguins.. you just can't go wrong with that! Russia, Belarus, Kazakhstan, Singapore and France added. New UK release date. I can't believe it will premiere here in Portugal a month after!!! July 21th!